The greed for money and power undermines those in the power structure, from politicians to big business and trade negotiators, and even police. 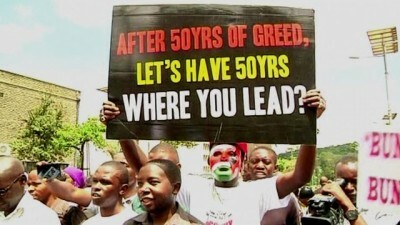 While they may view greed as a strength – it drives corrupt politicians and big business to consistently push for more power and money – it can also be a weakness by leading them to overreach and expose their corruption. We cannot count on those in the power structure to always undermine themselves, but when they do, we need to be there to point it out and help their mistakes ensure their defeat. The Trans Pacific Partnership (TPP) negotiators in Hawaii were met by protesters, including the largest conch shell blow in world history, with four hundred people blowing conch shells outside the hotel where the negotiations were going on. The negotiators did not reach the conclusion they had promised as major areas of disagreement remain between the big economies of the US, Canada, Australia, New Zealand and Japan, particularly because of the aggressive positions of the US negotiators. The US is insisting on provisions that will protect the profits of pharmaceutical and other medical corporations and that will destroy some of the best healthcare systems in the world (Japan, Canada, Australia and New Zealand). 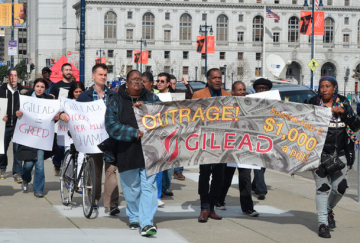 The US is using its bully power to force the failed and abusive US market model of privatized healthcare on countries that have strong public health systems. Many other big issues remain, among them are trade-related dairy and autos, biologic’s patent exclusivity periods, the role of Internet service providers regarding copyright and details of investor-state dispute settlement provisions. 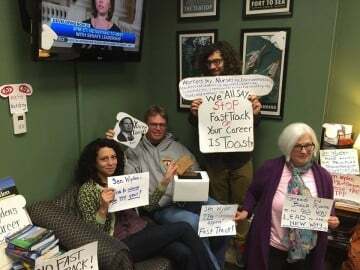 “Your career is toast” protest in Senator Wyden’s office. As a result, negotiators left Hawaii without a schedule for a next meeting. Elections are complicating progress, with Stephen Harper in a close re-election race, Shinzo Abe of Japan’s popularity dropping and trade becoming an issue in US elections as political payback for the TPP Fast Track vote is beginning. At this point, it looks like the delaymay mean that the TPP will not be reviewed in Congress until the 2016 election year starts. 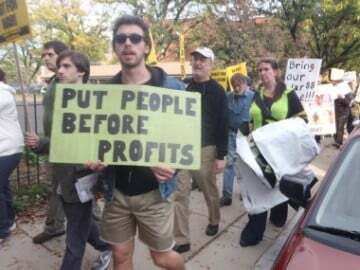 The election year is an opportunity for the movement against trade rigged for big business to make the TPP a national issue and to push for a new direction for trade that puts protection of people and the planet before profits. Join us in organizing to stop the TPP and the other corporate treaties, the TransAtlantic Trade and Investment Partnership (TTIP) and the Trade in Services Agreement (TiSA). Click here to take the TPP action pledge. While Medicare’s 50th Birthday was celebrated across the nation, with people advocatingfor Medicare to be improved and expanded to cover all Americans, there are signs of trouble in US healthcare. The new slogan of the single payer movement is “Medicare for All: American as Apple PIE” with PIE standing for Protect, Improve, Expand. But, the reality is that we know Medicare is under attack, constantly facing cutbacks and privatization, and this attack is bi-partisan in nature showing the truth of the saying that the difference between Republicans who overtly want to dismantle Medicare and Democrats who are privatizing Medicare is Republicans stab you in the front while Democrats stab you in the back. On the broader healthcare issues the United States, already the most costly in the world, is the concern that the private health insurance industry is becoming more concentrated. Anthem Inc announced its intent to buy Cigna Corp in a deal valued at $54.2 billion, creating the largest U.S. health insurer by membership. Three weeks ago Aetna Inc agreed to buy Humana Inc for $37 billion. Further concentration of the insurance industry is very likely to lead to higher prices and worse service. The end of private, independent medical practices is going to be one more step in the destruction of healthcare in the United States. Add to that one more trend – the incredible increase in the price of pharmaceuticals (which as we note above the US is trying to push on the world). The cost of cancer drugs has doubled over the last decade, some new drugs cost as much as $1,000 per pill making it impossible for patients to take the medicine they need. Doctors are complaining and urging the lowering of prices. So, as we celebrate Medicare’s fiftieth birthday there are lots of problems and challenges. 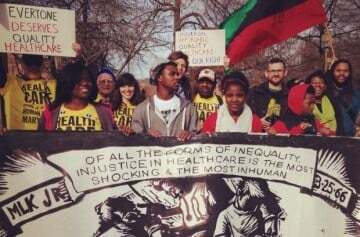 It is the job of the movement to organize people to ensure that when the wheels fall off the Obamacare bus, the people are organized to demand the only solution – improved and expanded Medicare for All. The time may come sooner than we expect. This week there were inspiring protests in Oregon that delayed Shell Oil’s plan to drill the Arctic for oil. Protesters dangled from a bridge to block Shell from getting its ice breaker out to sea. 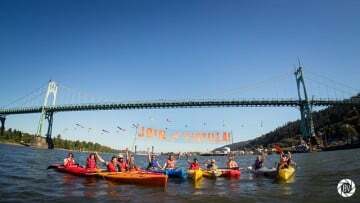 Theaction, which included 13 people hanging from the bridge while scores of kayactivists blocked the waters below, forced the boat to turn around and stay in port for 40 extra hours when every day matters as the Arctic drilling season window of opportunity is closing. In the end the protesters were removed from the bridge and the Shell ice breaker left Portland after an inspiring delay. 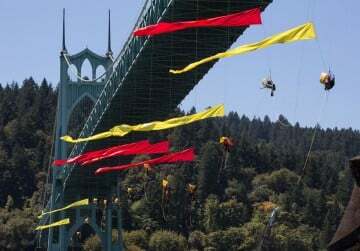 These were not the first protest of the sHELLNo campaign and will not be the last. Shell and other oil companies are experiencing opposition to their continued extreme extraction practices because of immediate threats to the environment and because each additional project pushes the globe closer to the climate tipping point. The industry is under attack by concerned citizens and is trying to figure out how to respond, but at the same time prices for oil and gas are dropping and the reality of climate change and the demand for policies to address it are increasing. While one participant expressed sadness – a day of tears – when the ice breaker went out to sea, and we share that disappointment, we also know this is part of an ongoing campaign and that people are working to stop carbon fuels in so many ways: fossil fuel divestment, fasting against FERC infrastructure, local protests at pipeline hearings,litigation, pipeline blockades, and artful protest. Each action inspires another and the movement gets stronger as the greed of the industry becomes more evident and the impact of their actions impact more of us and cause unpredictable environmental impacts likewidespread earthquakes. 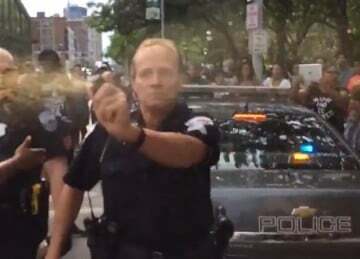 Another area related to greed is the police violence and abuse that has become more evident against communities of color, not only Blacks but the Indigenous as well as againstthe poor. This week the cries for justice for Sandra Bland grew louder. More people understand that it was Sandra’s standing up to institutional racism that led to her death; thatshe was a rebel standing up to abuse of power; and someone who realized it was her calling to stand up to a system of racism. At her funeral Sandra’s mother told people that she had a calling to challenge racism and issued a call to action for others to join the struggle. And, others are joining. People gain strength when they see others stand up to abuse of power and then when people experience it, they join the struggle as well. This weeknearly 2,000 people marched through Newark protesting police violence. Hundreds gathered in Cleveland at the#BlackLivesMatter conveningand their views were strengthened when police used pepper spray against them. We are also strengthened when we see protests resulting in police indictments, something that never happened before and is happening more regularly. 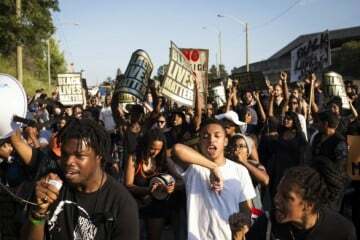 As we look toward the upcominganniversary of the death of Michael Brown, we should all look with great pride at the #BlackLivesMatter movement – its growth, impressive leadership and accomplishments. As the movement pushes for the radical transformation that is needed, it brings to light who is opposed to ending the injustice of abusive policing. It is the superwealthy who gain power, privilege and wealth from inequality, from keeping people poor and keeping communities of color down. Once again we learn the connection between the corrupt economy and the corrupt government and racism. And, we also see that that the power structure fears the movement as we learn they have beenmonitoring the activities of the movement for the last year. Christian Parenti writes about the roots of the American police state explaining: “At its heart, the new American repression is very much about the restoration and maintenance of ruling class power.” The modern police state’s roots are in the 1960s when “white supremacy, corporate power, capitalism, and the legitimacy of the US government, at home and abroad, all faced profound crisis.” He describes the history of the economic divide that sends money to the top while impoverishing most Americans and how racism is used to divide people to keep them from focusing on the political and economic establishment. The consciousness of the country is changing. People who used to be reformers, stuck inside the limits set by the two parties, are breaking out and realizing the deep corruption that is system-wide from the police on the street to senators, judges and presidents. No longer is it enough to be a “liberal” or a “progressive,” the times requires more. Consciousness is rising and with that so will the demands and actions of an organized populace. Sometimes it will take the shape of protests, other times a rebellion, sometimes cities will be shut down and there will be riots. The system is not responding to the reasonable demands for social, economic, racial and environmental justice. 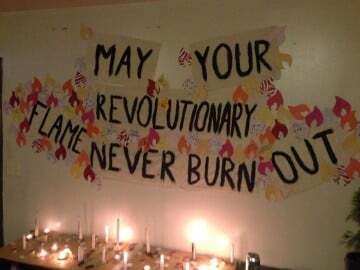 The failure to respond will result in uprisings and at the root will be the greed for money and power by those in the power structure who ignored these realities.